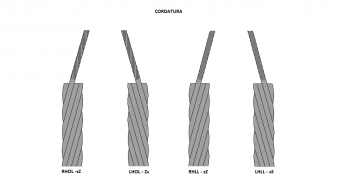 Santini Funi Srl supplies wire rope on reel and wire rope accessories. We have an internal laboratory to certify the galvanized grade of our galvanized wire ropes and, on request, we can test the chemical composition and effective breaking force of each wire rope. The sling works under simple shear. Slings are used (e.g. in architecture) to contrast forces due to weight. They can be equipped with eyebolts on their terminations. The eyebolts can be equipped with thimbles, and can be closed using various methods and accessories (hand spliced, closed with aluminium alloy ferrules, closed with clamps). To finely adjust sling stress, you can apply one or more coupling screws. In a marine environment, the cradles act as stays and fixed rigging. The cradle terminations can be given various types of covers depending on how they will be used. They are robust and durable. Thanks to their particular flexibility, they are used to transmit rotary and/or continual movements. They can be inserted in plastic sheaths and can be plasticised themselves. They have a wide range of uses, from the construction of bicycle, motorbike and car brakes to mechanical control systems for airplanes, from automation (e.g. : electric car windows) to internal combustion engines (e.g. : accelerator or grass trimmer motors, motorised brushes…). (Propylene, PVC, and Rilsan): these ropes are often used in the automobile sector and are generally suitable, thanks to the reduced friction of plastic compared to steel, where the rope is required to run smoothly. Plastic coatings can vary in colour and diameter according to customer requirements. Various types of wire rope are used which are equipped with appropriate accessories. They are used to manufacture both load bearing ropes and traction cables. 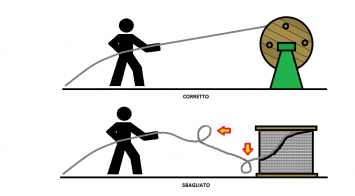 The wire rope can have a cross or parallel lay. Cross-lay has wires laid on the strand in the opposite direction to those of the strand itself in the rope. Parallel-lay has the wires laid in the same direction. 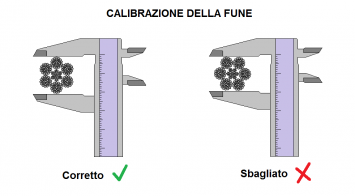 To correctly gauge the wire rope, you need to measure its maximum cross-section, rotate the rope into the caliber and intercept the point at which the strands or wires are aligned. To unwind the wire rope from the spool, you have to place it on a stand and unwind it so it does not twist and damage itself. Never unwind the rope from a vertical spool as you risk twisting it and irreparably damaging it. 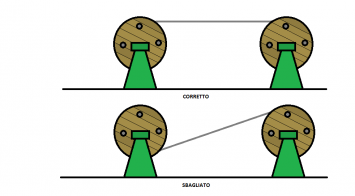 To transfer the wire rope from one spool to another, check the figure and keep the same direction of rotation for both spools.